We ask the questions. You watch data pour in from your team every week. Short and frequent pulsings reveal the truth about your company culture through anonymous responses and peer recognition. Start focusing your attention on the most impactful issues and stop wasting time on the small stuff. Employees anonymously upvote the issues that matter most to spark dialogue and incite positive change. Short and frequent pulse surveys reveal the truth about your company culture through anonymous responses and peer recognition. Get a full overview of the health of your company culture. Data is displayed visually on an organized dashboard to give you all the information you need at a glance. 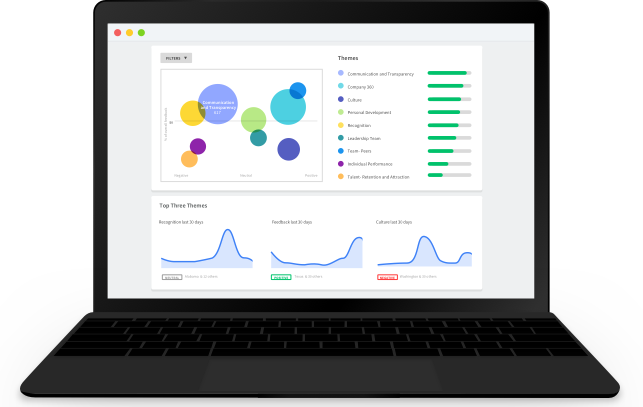 Sentiment analysis and powerful machine learning adapt to your organization, saving you time by highlighting trends and bringing the most information to your attention. Employees are empowered to lead with solutions. They give feedback about what's working and what's not, offer up their own suggestions, and even recognize peers for a job well done. You'll always know what matters most because pulsing results are streamed to a live feed, letting employees vote for their favorites. You set the schedule. We're flexible. Schedule your pulse surveys to ask the right questions at the right time for your business. Set the question queue in advance or make adjustments on the fly. We told you we're flexible. I honestly cannot recommend TINYpulse enough. 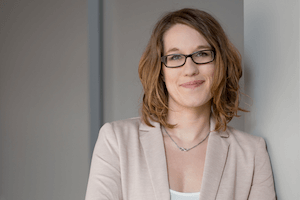 If you are serious about improving your culture and increasing the happiness level of your employees, you will not find a better service on the market to help you with these initiatives. Set it and forget it: Requires zero admin time. Every Wednesday I simply review the results with my exec team and fine-tune things to make sure the company is happy and productive. ROI: Happy employees = productive employees. Everyone always asks how we have such high retention and a great company culture, and we tell them, "TinyPulse!". We started using TINYpulse to receive feedback and measure the overall happiness within our company. 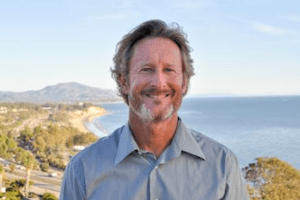 We have been pleasantly surprised with how easy it has been to integrate into the weekly schedule and the open and honest answers we have been receiving. I can’t recommend this tool enough as a means of listening to your team and improving company culture. Get actionable feedback in 5 simple steps and create happier employees. 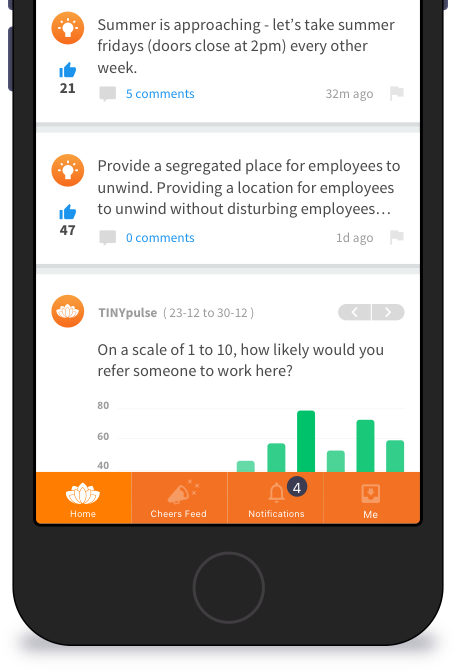 TINYpulse Engage sends a quick, one question pulse to your employees each week.  Employees can respond using the employee portal on their desktop or on their iOS or Android device. We even send reminders to those who forget to respond. All pulsing survey responses are 100% anonymous, so employees feel comfortable giving completely honest feedback. Employees aren't limited just to the survey question. They can also send peer recognition and submit their own suggestions at any time they'd like. A great culture encourages communication across the workforce, not just between employees and their managers. Using Cheers for Peers, employees can send kudos to their colleagues whenever they do something great. The suggestion box lets them voice their feedback and offer solutions for any issue that's on their mind. Once five responses have been submitted, your company results are displayed on the dashboard. It's packed with data, including response rates, average scores, and benchmarks to help you track vital statistics and reveal trends. 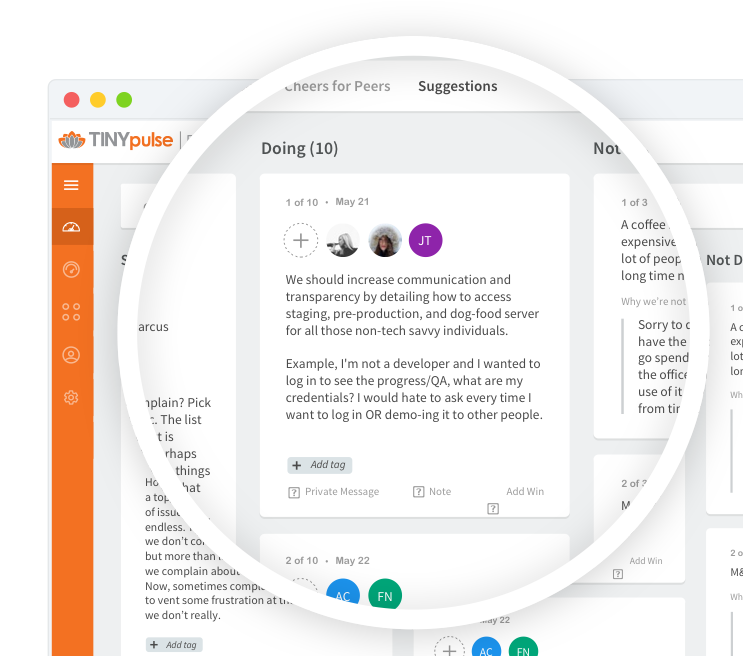 The one big drawback of anonymous feedback is that you can’t follow up with the respondent — unless you have TINYpulse's private messaging feature. This allows you to contact employees about their responses without ever knowing who they are. Ask for clarification, additional details, or suggestions to help you take action on their feedback. They'll feel safe responding knowing their anonymity is maintained. With Live Pulsing, results are streamed directly to employee portals where they can view results and vote for the responses and suggestions that matter most. 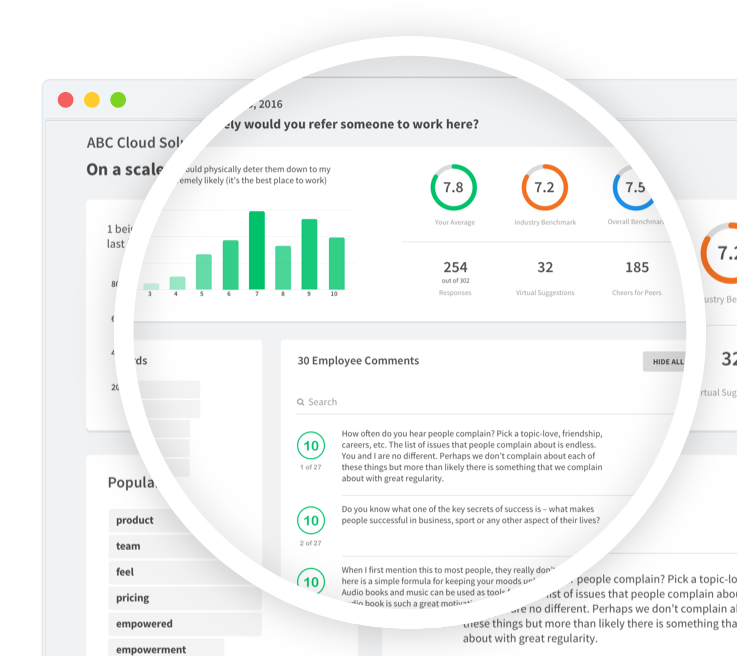 Employees can anonymously comment on items to interact with administrators, promoting full transparency throughout your organization. 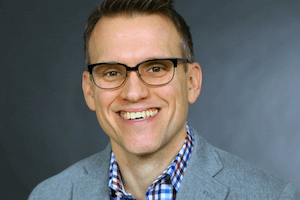 If real-time sharing isn't for you, administrators can export pulsing survey results to various formats to present to leaders and the broader organization. We're all about transparency and more than happy to help you improve yours. 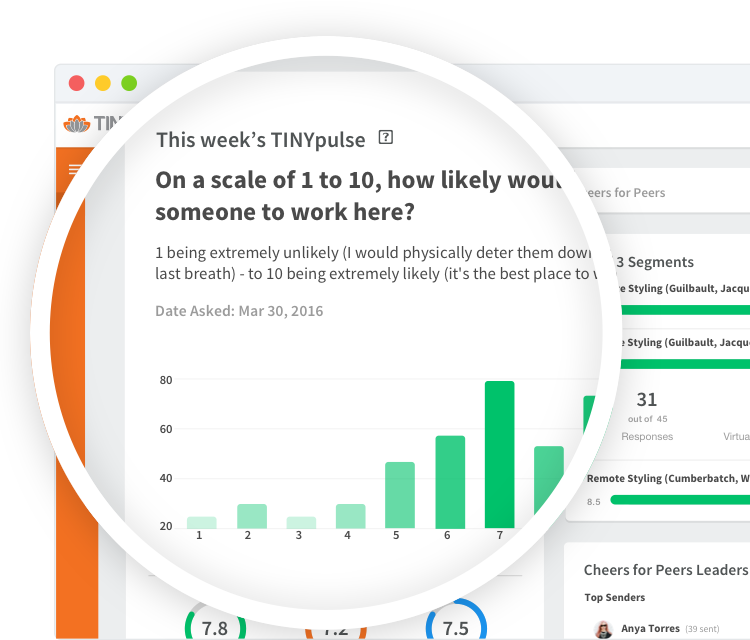 TINYpulse Engage sends a quick, one-question pulse to your employees each week. Employees can respond using the employee portal on their desktop or on their iOS or Android device. We even send reminders to those who forget to respond. If real time sharing isn't for you, Administrators can export survey results to various formats to present to leaders and the broader organization. We're all about transparency and more than happy to help you improve yours. Attend THE leadership conference for professionals who believe in culture as a competitive advantage.